Since we are a clothing line we are always on the lookout for new ideas which requires a ton of research. While doing some recent research we have came across something that we found to be way to interesting to not share. 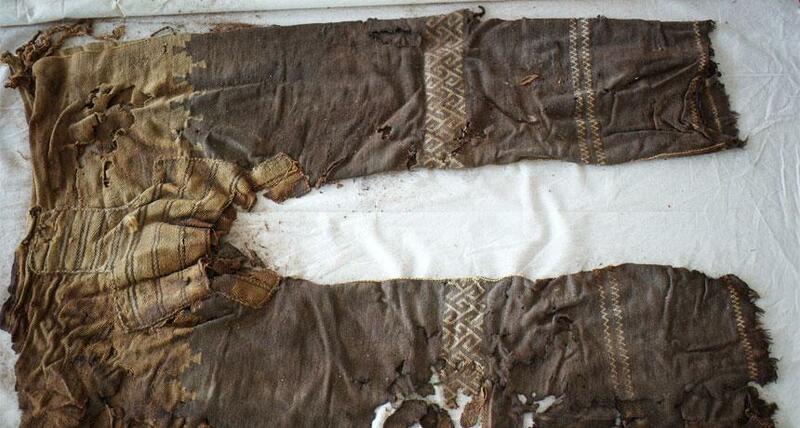 That is the oldest pants found dating back to 3,300 years ago. The pants were found on a archaeology dig when Archaeologists pulled two men’s fully clothed corpses from a tomb in Western China. The two men were found to be Nomadic Herders and the pants that they were found wearing were found to be some kind of riding pants that they must have worn. The pants were made of Wool With straight fitting legs and a wide crotch. They were also adorned with patterns on the knees and lower half of the trousers making them not only useful but also somewhat stylish at the same time. The trousers were not cut out of a design like they do nowadays to make the pants that are worn instead each pair of trousers was sewn together from three pieces of brown-colored wool cloth, one piece for each leg and an insert for the crotch. The tailoring involved no cutting: Pant sections were shaped on a loom in the final size. Finished pants included side slits, strings for fastening at the waist and woven designs on the legs.